Check Out Will Roberson's Just Released CD! For the very best in live solo entertainment for your wedding, special event, party and/or restaurant/club establishment, Amerientertainment presents Will Roberson. 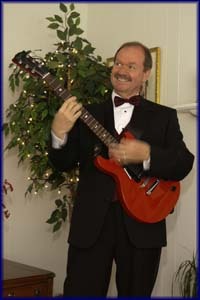 A master guitarist and accomplished singer, Will offers a long, versatile songlist of popular hits that is guaranteed to please your guests, young or old. Will is a professional that has honed his talent with more than forty years of experience. Devoted to music, the very talented Will is a tireless, flamboyant worker. Acting as lead guitarist for such greats as "Percy Sledge," (When A Man Loves A Woman), "Southern Sounds of Soul" and many more, Will has been recorded on 3 CDs. We invite you Click Here to learn more about Will's exciting career. The sounds of Will Roberson will Guarantee that your special event will be a success! Will is available for engagements throughout the entire continental United States. We invite you to contact us to schedule Will's entertainment for your event. For your convenience, we have provided the current booking schedule below. The schedule is frequently updated and subject to change. Whether formal or casual, eight to eighty, Hip Hop, Rock, Country or Nostalgic, Will Roberson guar-antees to deliver the perfect entertainment to make your special occasion a success!